A light and fresh salad tossed in olive oil, lemon juice, and oregano for simple and bright Mediterranean-inspired flavors. 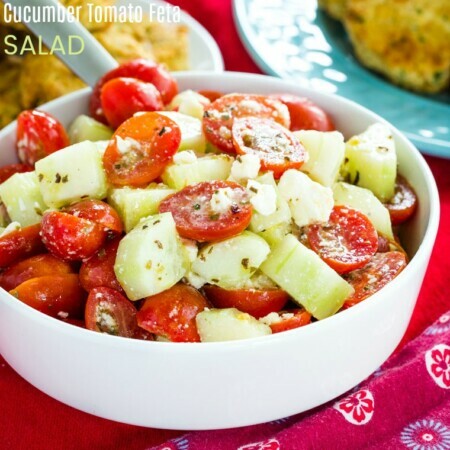 Cucumber Tomato Feta Salad is a light and fresh salad made with just a few basic ingredients. 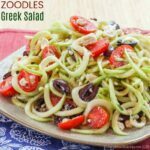 Tossed in a simple dressing of olive oil, lemon juice, and oregano, you’ll love the Mediterranean-inspired flavors. Whether you are making falafel or putting some Greek chicken or beef kabobs on the grill, this tomato cucumber salad with feta cheese is the perfect addition. It is a delicious gluten free salad recipe to add to all of your summer meals. Tomato cucumber salad was a staple of my childhood. It would often make an appearance at family barbecues. And if we were going to grandma’s for Sunday dinner, you can bet grandpa picked a few tomatoes and cucumbers from his garden so she could make a batch. In our family, this summer salad started with fresh tomatoes cut into chunks and cucumbers peeled and sliced. Then those veggies were just tossed in bottled Italian dressing or Red Wine Vinegar Dressing. Or occasionally a combination of both. 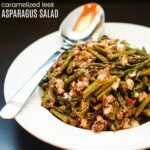 I had no idea till I was an adult that recipes for this salad actually existed. Actually, I thought everyone just doused their cukes and ‘maters in dressing. I love it, but perhaps not the healthiest option despite all the vegetable goodness. And honestly, I don’t even make it much because I have one kid who doesn’t eat raw tomatoes, one kid who wants extra tomatoes, and a husband who doesn’t eat cucumbers. You should see what it looks like when I try to spoon this combination out into bowls. It literally takes minutes to toss together this simple side dish. You could even add some cooked and cooled shrimp and turn it into a light summer lunch or dinner. How do you make Cucumber Tomato Feta Salad? Start by cutting your tomatoes. If you use large tomatoes, you might want to squeeze out some of the excess seeds and liquid before cutting it into about half-inch chunks. If you use grape tomatoes, cutting them in half will be fine. Personally, I prefer to peel my cucumbers. You can leave the seeds in, scrape them out with a spoon, or use seedless English cucumbers. It’s your call. After cutting the tomatoes and cucumbers, place them in a bowl and add fresh lemon juice, olive oil, salt, and pepper. Then you’ll add oregano. Fresh oregano really enhances the bright flavors, but dried oregano works in a pinch. Toss everything together, then add the feta before one last toss so that you don’t break up all of the crumbles. 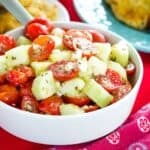 Is tomato cucumber salad healthy? Unlike the salads of my childhood that were slathered in an overabundance of bottled dressing, this Cucumber Tomato Feta Salad is very healthy. 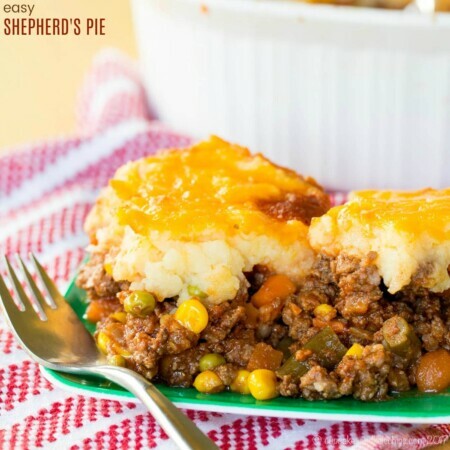 It’s filled with fresh vegetables and tossed in a light coating of olive oil and fresh lemon juice. Then with just a half cup of feta cheese in the whole recipe, you get all of that unmistakable briny, tangy flavor and crumbly texture without a ton of extra calories. 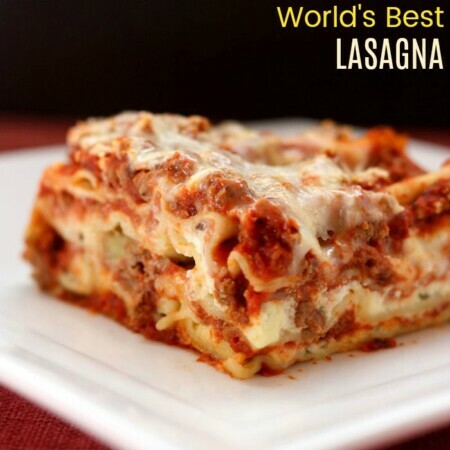 Plus, this recipe is naturally gluten free and low carb. 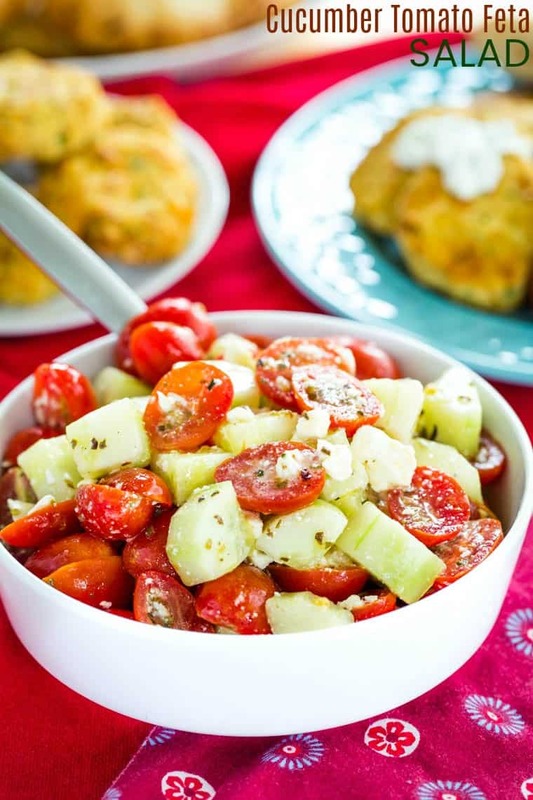 What can you serve this Cucumber Tomato Feta Salad with? Make it a savory brunch with Tomato Feta Spinach Frittata. Mediterranean Chicken Pinwheels can be packed in a lunchbox with this salad. Alongside these Greek Chicken Stuffed Zucchini Boats, you can have a simple and low carb weeknight dinner. Fire up the grill over the weekend with Greek-Style Beef Kabobs. It can even be part of a holiday meal with this Easy Lamb Roast. 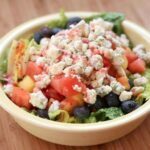 What are some more summer salad recipes? What’s the best knife for cutting tomatoes? If I am going to cut tomatoes, I always reach for my 5″ Wusthof Utility Knife. I use it often, so it does need the occasional sharpening. But when it is sharp it cuts through those tomatoes like butter without squishing them. This knife is definitely one of the workhorses in my kitchen. It’s great for those cucumbers too. This veggie salad will become a go-to side dish this summer. You can always find delicious grape tomatoes and cucumber at the grocery store. But it will be even better with the fresh abundance from the farmers market or right out of the garden in your backyard. And you probably already have the rest of the ingredients in your refrigerator or pantry. 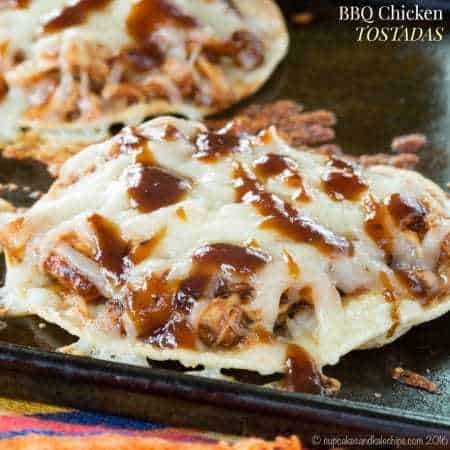 Enjoy it at a barbecue or any time you fire up the grill this season. Or just toss it together when you are cooking some simple chicken or shrimp. Combine the tomatoes and cucumbers in a bowl. Add the olive oil, lemon juice, oregano, salt, and pepper, and toss gently. Then add the feta cheese and give it one final toss. Serve immediately or store it in the refrigerator. I’m so glad that you enjoyed it, Tina. Thank you for your comment!